Do you have a party or celebration coming up? Well you came to the right place. Here at Koester Inflatables Party Rentals we have a variety of Inflatable's to chose from for all ages. We set up and attend your event for your safety for free! So call today for your party or request a quote and one of our friendly staff members will get back to you right away! 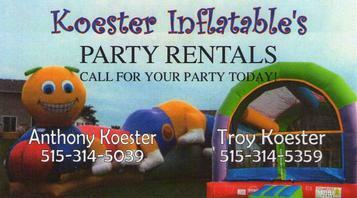 "Here at Koester Inflatable's Party Rentals we strive on making our customers number one. With our affordable price's and friendly staff to make your party a fun long lasting memory!" Anything to bring family's & friends together!